Providing AV systems integration and AV equipment sales to businesses and organizations across the mid-Atlantic and the US. 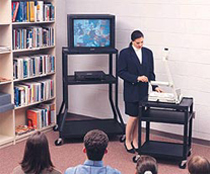 AVIVA features carts and stands from Da-Lite, including: pre-assembled PIXMobile monitor/television carts, ready to Assemble PIXMate projection, monitor/television carts and plastic carts, multi-purpose carts, or fixed, flat-panel carts and stands. Popular items include The PixMate® Flat Panel Stands. These stands are UL approved and feature heavy duty, 5-inch swivel casters. The monitor mount works universally with most flat panel monitors up to a 50" diagonal. The unique rail mounting system ensures an easy installation for the monitor with the added security of a key operated lock. Mount provides 5 degrees of backward tilt and 15 degrees of forward tilt. For more information about AV system integration services from AVIVA, contact Lee Wilkinson at 804.353.9212. Of course, if you are not ready to purchase you can always rent. Check out related AV rental options to the right and give us a call at 804.353.9212 and let us know how we can assist you with your AV rental equipment requirements. Providing AV system integration and AV and presentation product sales to all of Virginia and the mid-Atlantic.